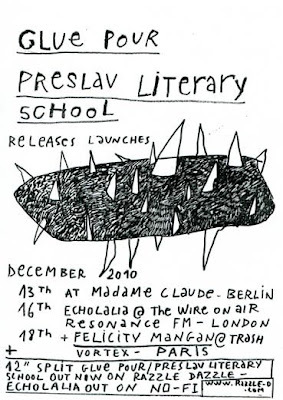 Preslav Literary School: Dezember Konzerte. To celebrate the release of the Preslav Literary School/Glue Pour split 12" on Razzle Dazzle, Benjamin and I will be taking our wholesome racket to three European capitals this December. TBC, Paris. Sat 18 Dec.
Lots of new merchandise available, yule see.